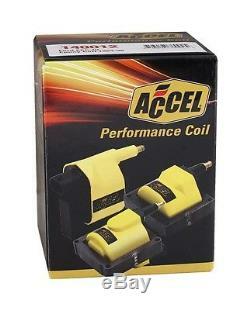 Ignition Coil-Super Coil ACCEL 140012. Specialized high temperature epoxy resists shock and vibration, while increasing thermal conductivity. These are direct plug replacements for OEM coils. They feature bodies and, or secondary towers molded in ACCEL yellow and feature brass secondary contacts (except direct fire coil on plug applications). Product Description - Extended 240 : Super Coil; EEC-IV; Primary Resist 0.2 Ohms Secondary 8.8 k Ohms; Turn Ratio 132:1; Max Voltage 48000V; Yellow. Associated Comments - 2000 : Standard Motor Products SMP Fd-478. Interchange Part Number : DG-470, FD-478, 8227, 5189, C839, 6A2, 5C1116. Product Description - Long - 80 : FORD 1984-98 EEC-IV SUPERCOIL. Product Description - Short - 20 : Ignition/Electrical. See Item Specifics section for additional specifications about this part. The engine types may include 1.6L 1598CC 98Cu. L4 GAS SOHC Naturally Aspirated, 1.6L 1598CC 98Cu. L4 GAS SOHC Turbocharged, 1.9L 116Cu. L4 GAS SOHC Naturally Aspirated, 2.0L 1989CC 122Cu. L4 GAS DOHC Naturally Aspirated, 2.0L 1989CC 122Cu. L4 GAS SOHC Naturally Aspirated, 2.0L 1991CC l4 GAS DOHC Naturally Aspirated, 2.3L 140Cu. L4 GAS Naturally Aspirated, 2.3L 140Cu. L4 GAS OHV Naturally Aspirated, 2.3L 140Cu. L4 GAS SOHC Naturally Aspirated, 2.3L 140Cu. L4 GAS SOHC Turbocharged, 2.3L 140Cu. L4 LPG SOHC Naturally Aspirated, 2.5L 153Cu. L4 GAS OHV Naturally Aspirated, 2.8L 171Cu. V6 GAS OHV Naturally Aspirated, 2.9L 177Cu. V6 GAS OHV Naturally Aspirated, 3.0L 2986CC 182Cu. V6 FLEX OHV Naturally Aspirated, 3.0L 2986CC 182Cu. V6 GAS DOHC Naturally Aspirated, 3.0L 2986CC 182Cu. V6 GAS OHV Naturally Aspirated, 3.8L 232Cu. V6 GAS OHV Supercharged, 3.8L 3797CC 232Cu. V6 GAS OHV Naturally Aspirated, 4.9L 300Cu. L6 GAS OHV Naturally Aspirated, 4.9L 4917CC 300Cu. L6 BI-FUEL OHV Naturally Aspirated, 4.9L 4917CC 300Cu. L6 LPG OHV Naturally Aspirated, 5.0L 302Cu. V8 GAS OHV Naturally Aspirated, 5.0L 4949CC 302Cu. V8 GAS OHV Naturally Aspirated, 5.4L 330Cu. V8 CNG SOHC Naturally Aspirated, 5.4L 330Cu. V8 GAS SOHC Naturally Aspirated, 5.8L 351Cu. V8 GAS OHV Naturally Aspirated, 7.5L 460Cu. V8 GAS OHV Naturally Aspirated. This part fits vehicles made in the following years 1983, 1984, 1985, 1986, 1987, 1988, 1989, 1990, 1991, 1992, 1993, 1994, 1995, 1996, 1997. Superseded and Interchange Part Numbers. Supersessions This item may have been superseded from a different part number from this manufacture. 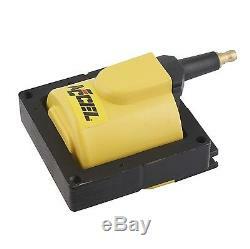 Brand: ACCEL Part Numbers: 140012ACC Interchange This item may interchange to the following part numbers from other brands. SYSTEMS, AUTOZONE/AEM, AUTOZONE/DURALAST-WELLS, AUTOZONE/MALLORY, AUTOZONE/MOTORCRAFT, AUTOZONE/MSD, AUTOZONE/WAI, BECK/ARNLEY, BOSCH, CARQUEST RED/WELLS, CARQUEST/WELLS, HYPERTECH, MALLORY, MIGHTY, MOTORCRAFT, MSD IGNIT. Electrical parts are non returnable. We are not responsible for any expenses caused by defective parts from or during installation. Return item must be packed properly. Actual products may differ in appearance and contents. Portions of the part information on this page have been provided by WHI Solutions, Inc. The item "Ignition Coil-Super Coil ACCEL 140012" is in sale since Friday, April 21, 2017. This item is in the category "Automotive\Parts & Accessories\Car & Truck Parts\Ignition Systems\Coils, Modules & Pick-Ups".